Failed troll. 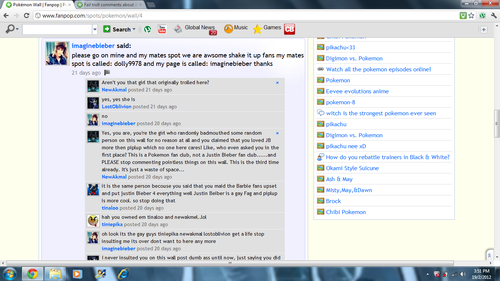 Pokemon hater tries to promote her new club on a Pokemon Fan-Club wall.. imaginebieber, A person who HATES Pokemon, tries to promote her club on the Pokemon Fan-wall despite hating Pokemon and knowing that we all recognize her as a Troll.. HD Wallpaper and background images in the fanpop FAIL! club tagged: fail facepalm stupid lame pathetic. 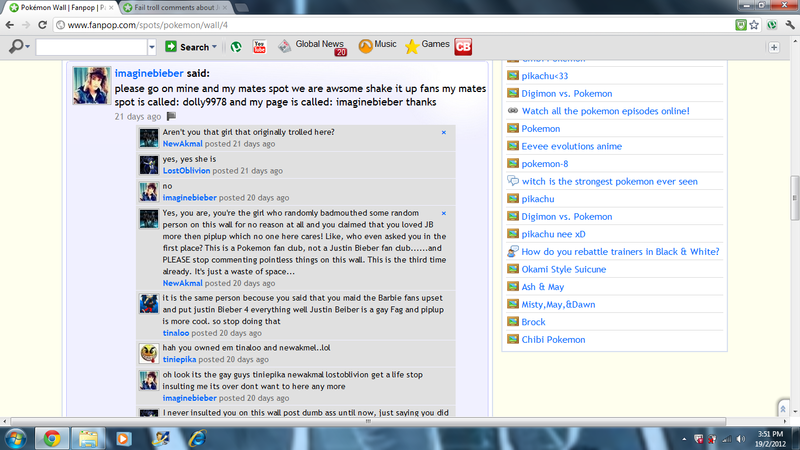 imaginebieber, A person who HATES Pokemon, tries to promote her club on the Pokemon Fan-wall despite hating Pokemon and knowing that we all recognize her as a Troll. Here is another picture of that failed troll. If you people can't see the pic properly, just click on the picture. You'll see a full image. Lol, don't know what will be the results of this case.